Morgan Stanley Sees 70% Chance Of Downturn "As Early As Next Month"
On a day when stocks are surging because the Chinese economy is no longer sliding into contraction (according to China), one can trust Wall Street's latest "superskeptical" foil, Morgan Stanley, to come out with a report that spoils the party. Sure enough, in a note from strategist Serena Tang published earlier today, she writes that while Morgan Stanley's updated US market cycle indicator is still in expansion, a phase in which it has been since 2014, the bank is now estimating that there is a 70% likelihood that this will shift to downturn over the next 12 months, and that if the recent deterioration in data persists, we could see "a switch from expansion to downturn as early as next month." As Tang explains, while "such turns do not necessarily mean recession" they do correspond to "materially worse return environments for credit and equities." And so, coupled with generally low bottom-up returns from Morgan Stanley strategists' forecasts, the bank "leans back against dreams of Goldilocks" and believes that this supports more defensive asset allocation. Here are the details behind Morgan Stanley's unexpectedly downbeat call. 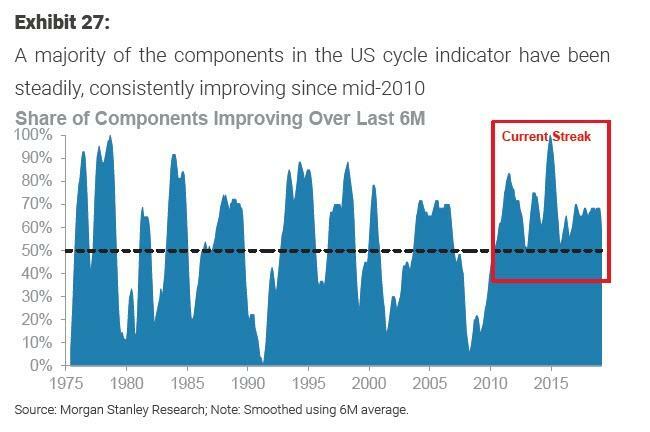 First, a quick recap of what prompted the trigger: Morgan Stanley's US cycle indicator combines metrics across macro, the credit cycle and corporate aggression to pinpoint where we are in the market cycle, as shown in the chart below which compares the latest iteration of the model with its most recent revision. Of note, the revised US cycle indicator (v2019) is meant to better flag turns in real time, with greater confidence and less lag. We don't think that this expansion can be sustained for long: Exhibit 26 shows our real-time downturn probability gauge, which estimates the chance of our cycle model inflecting to downturn from expansion within the next 12 months, based on historical experience. What this chart suggests is that, given the level of the cycle indicator, the chance of a shift to downturn over the next 12 months is elevated at close to 70%, up from ~60% from end-2017 when we last checked up on the cycle. 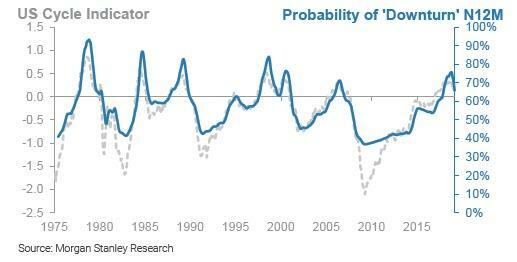 As a result, the probability the US cycle indicator switching from expansion to downturn is the most elevated it's been since 2005/2006, suggesting an imminent cycle peak. In fact, a backtest shows that the probability of a downturn is now higher than it was either right before the global financial crisis or just before the dot com bust. Of course, Morgan Stanley does not make such downbeat calls lightly - after all its clients like most other investors have been habituated by the Fed to expect only market upside - and offers extensive caveats, the first of which is that the current reading "doesn't necessarily mean a recession is imminent – every US recession since 1955 (there have been nine) was preceded by downturn in the US cycle indicator, but not every downturn phase meant a recession would follow." Additionally, Tang writes that the bank's US economics team believes that the US is moving through a trough now, and more to the point, "its real-time model suggests that the probability of a recession this year remains below 10%"; this rose-colored spin is helped by Morgan Stanley's global economics team which also sees the trio of trade tensions easing, China's policy easing and the Fed's focus on flexibility and patience as leading global growth to bottom in 1Q19. "This will be important to monitor" the bank adds. With that caveat out of the way, here is what the cycle indicator does monitor: the cycle indicator relies on the idea that a composite of measures provides the best read on the market cycle over time. But we take some heart from other signposts, outside the model, that are sending similar signals. Around an inflection in the market cycle inflection, investors typically see credit spreads trough, bond yields peak, ISM decline and a compressed output gap. All are present today. If MS is right, what does that mean for assets? The bank, somewhat redundantly, explains that downturns tend to see stocks and credit underperform versus average while bonds outperform, in contrast to expansion, where equities benefit from a boost to returns from the cycle. This is shown in the charts below, which look at returns (versus average) by cycle phase. Finally, going back to its cycle indicator, Morgan Stanley drills down on what key driver has been behind this prediction and explains that "the strong unbroken run of improving data over the last year has been the main culprit." Specifically, since April 2010, we've not had a six-month period where a majority of the components of the cycle indicator were not improving: "it is, to our knowledge, the longest streak in history ( Exhibit 27 )." Historically, such an environment of data improvement breadth and depth (with the likes of unemployment rate and consumer confidence hitting extreme levels in recent months) has meant a high probability of cycle deterioration in the next 12 months – "after all, what goes up must come down", as Morgan Stanley puts it simply. In other words, the MS model is basically a glorified mean-revision timing indicator. That doesn't mean that it is wrong, however. Indeed, the latest disappointing consumer confidence data pushes the number of cycle indicator components deteriorating over the last six months to seven now – enough to be considered what MS dubs 'critical mass'. 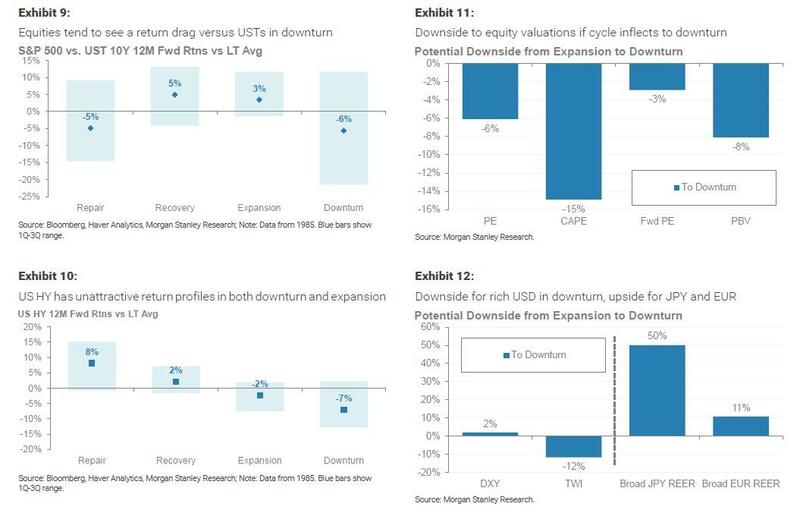 And here is the punchline: "if such deterioration persists, our rules-based approach to identifying cycle phases could very well call a switch from expansion to downturn as early as next month." 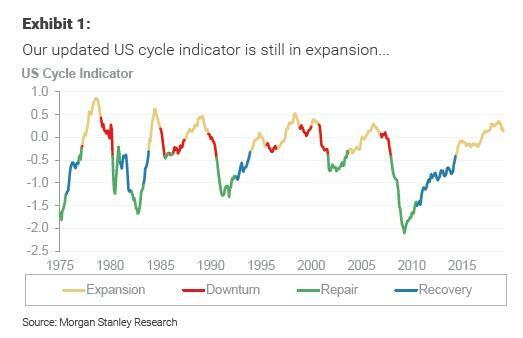 Finally, even if there is a modest improvement, Morgan Stanley concludes that "our market cycle indicator and the probability gauge are very clear – an inflection from expansion to downturn is on the horizon."